Whether you are a museum curator, researcher, student, or educator, there are a number of resources that can help with learning how to navigate Arctos. We are continuing to add to these resources to help make the Arctos learning experience easier. Quick Tour – Check out basic Arctos features for searching, viewing, mapping, and managing data. Arctos Handbook – The Arctos Handbook provides detailed documentation, how-to guides, and resources for Arctos data managers. This is a work in progress, and feedback and contributions are always welcome. Presentations – Powerpoint presentations about Arctos that have been given at professional and community meetings. Webinars – A series of online presentations aimed at anyone interested in learning more about Arctos. AIM-UP! 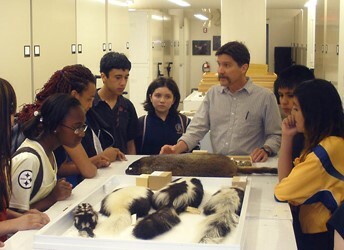 Advancing Integration of Museums into Undergraduate Education – A NSF-funded Research Coordination Network project that explores the use of natural history collections, museum databases (including Arctos), and biodiversity resources in undergraduate education. Includes Educational Modules and Tutorials .